There are many ways to build a winner. The Golden State Warriors lay claim to the league’s only Big Four, while the traditional Big Threes reside in Houston, Oklahoma City, and Minnesota (Yes, Boston will undoubtedly join the club next year). There are many more with dynamic duos, and with all due respect to DeMar DeRozan’s thoroughly entertaining Neo claims, The One calls Cleveland home, for now. The Toronto Raptors are a bit different. Masai Ujiri didn’t have the requisite cap space to make a big splash, but did have a myriad of draft picks at his disposal. He used some on the likes of Delon Wright and OG Anunoby, and others in trades to either cut the fat (DeMarre Carroll) or add to the team’s muscle (Serge Ibaka). Year after year, he set out building a team in every sense of the word, one whose weakest link could still be a strength. As fate would have it, though, the team that racked up a franchise-record 59 wins to earn the top seed in the Eastern Conference needed a player who went undrafted to close out the Washington Wizards. For five games, the bench the Raptors’ front office built just didn’t quite look the same as the one that took over games during the regular season. The crisp player cuts, the ball that moved in anticipation of where a teammate would be rather than where they stood, and the back-breaking shot making that allowed not only the dynamic duo of Pascal Siakam and Jakob Poeltl to thrive inside, but gave sharpshooter C.J. Miles the ever so slight breathing room he needs to fire on all cylinders. Sure, C.J. Miles and Wright had their individual moments to help the Raptors win at home, but the beauty of the Bench Mob is what they do in unison. Fred VanVleet is the one who makes it all work. There are certain players who impact the game in ways — as SB Nation’s Seerat Sohi tweeted — we are yet to quantify, and therefore undervalue as a result. A couple of bench stars who come to mind are Robert Horry and the ageless wonder Manu Ginobili. Each had/has a way of impacting the game beyond the stat sheet. They both are synonymous with a steely competitive spirit, an undeniable will to win, and the ability to seemingly dictate the narrative of a game in each of their own ways. Both are ultimately remembered as winners… champions. VanVleet carries those same characteristics. When Toronto faced what was considered a statement game against a Cleveland Cavaliers squad that had just welcomed the return of Isaiah Thomas, it was VanVleet who found another gear in the absence of Kyle Lowry with 22 points, four rebounds and four assists to help the Raptors to a 133-99 drubbing on their home floor. When the teams did battle once again in Cleveland, it was VanVleet who — now accustomed to closing fourth quarters — received a pass with the Raptors leading by one with under four minutes. He missed a corner three he’d usually make in his sleep, and reacted like he knew it. A LeBron James dunk followed on the other end to inspire a 6-0 run, and the Cavaliers went on to win 132-129. Regardless of the result, VanVleet is a man to be trusted in these situations. Moments that can often consume and get the better of others, leave VanVleet unfettered. So, on Friday night in Washington, with the No.1 seeded Raptors looking to earn their first road win of these playoffs, it was only fitting that VanVleet inspired them to a decisive 102-92 Game 6 victory to seal the third first-round series victory in five tries for the Ujiri-Dwane Casey-DeMar DeRozan-Kyle Lowry-Jonas Valanciunas era. The impact he had was undeniable. 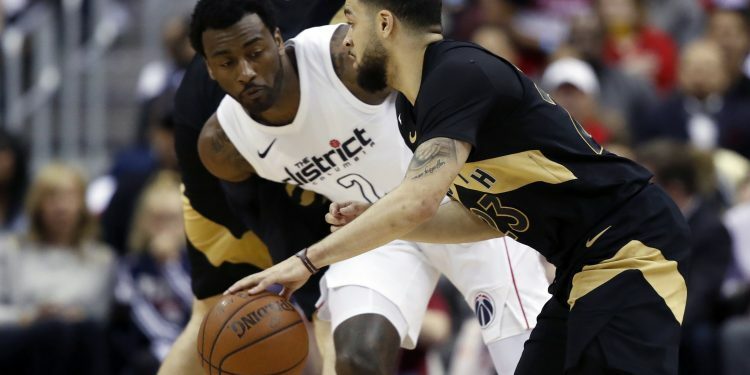 The Raptors trailed by 10 to open the second quarter, after the introduction of Kelly Oubre Jr. to the starting unit in place of Otto Porter Jr. looked an inspired move for Washington. The Wizards jumped out to an early 18-6 lead, hitting six of their first eight shots. It’s the first time they’ve led early in a game this series, with the Raptors having accumulated a score of 134-84 over the first nine-ish minutes of the five prior games. Within his first four minutes, VanVleet had two points, two rebounds and three assists to spark a 13-4 run that cut the Wizards lead to one. Poeltl got himself into early foul trouble, so Casey gave Valanciunas some run with the rest of the bench unit. It was a unit that played just five minutes together during the regular season, but just as he did throughout the season, VanVleet took the rubik’s cube that at first appeared mismatched, and went about putting the colours in their right spots. “Running the team and playing defence and stuff, I can do those things in my sleep,” VanVleet said after the game. As the game wore on, Casey and the Raptors invested in winning the war while the Wizards lived for the battle and hoped for the best. Bradley Beal and John Wall played and played as they had all series, while Toronto managed their stars’ rest to ensure a lethal final blow. Trailing 78-73 entering the fourth quarter, the bench unit went to work once again. After a pair of Poeltl free-throws, VanVleet found the range and knocked down a three to tie the game. It was a reminder that he had to be respected as an outside threat despite just returning from a shoulder injury, a mental note for Wizards defenders that paid off just a few minutes later. After VanVleet hands Wright the ball, watch how far back he moves. The threat of him as a shooter means Ty Lawson can’t sag off to the extent that Markieff Morris does off Siakam in the corner, and so gives Wright just that little bit extra room to put Marcin Gortat on skates and get all the way to the rack. Without the second-year guard, C.J. Miles is the only member of this unit who provides a shooting threat. It shrinks the court that much more for the defence, taking away the extent to which Wright is a drive threat, taking away Miles as a three-point threat, and asking a lot of both Poeltl and Siakam. As the pressure heats up on the road, it can lead to uncertainty, and perhaps even a level of insecurity in knowing their weaknesses are being exposed. VanVleet is the gatekeeper who unlocks the rest of their games. Just like that, Wright and Siakam have room to operate off the bounce and the dribble penetration of the three playmakers causes so much of a concern that Poeltl becomes a nightmare on the offensive glass. The Raptors were chewed up and spat out in Game 3, bruised and battered in the fourth quarter of Game 4. The bench swag was gone. So far gone in fact that Kelly Oubre Jr. thought it wise to call out Wright for his road performances. With VanVleet back, the swagger is back, and with him in the lineup, the Raptors are all about winning. Will Lou Will Return to TO? Are the Toronto Raptors Better With or Without Rudy Gay?